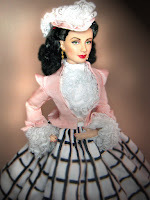 The white gown you see in the previous posts worn by the Tonner Scarlett doll is inspired by the Bette Davis movie "Jezebel" and was recreated by Alana Bennett (www. dollfashionsbyalana.com). Alana is a talented doll seamstress who has done fashions from Gone with the Wind, Titanic and whatever you can possible think of. The blue lace gown is another piece done by Alana. We thought of doing this gown from the TV Series "Scarlett". She not only added the gloves, she gave me pantalets, hooped skirt and a nice night purse to go with this outfit. 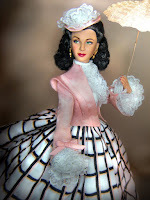 The Pink ensemble is the "Trip to Saratoga" outfit by Tonner worn by the doll which has been repainted. 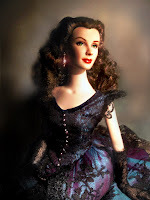 The purple dress is Tonner's "In the Mist" doll for their GWTW collection. I thought of putting the doll against the sad backdrop of Tara.